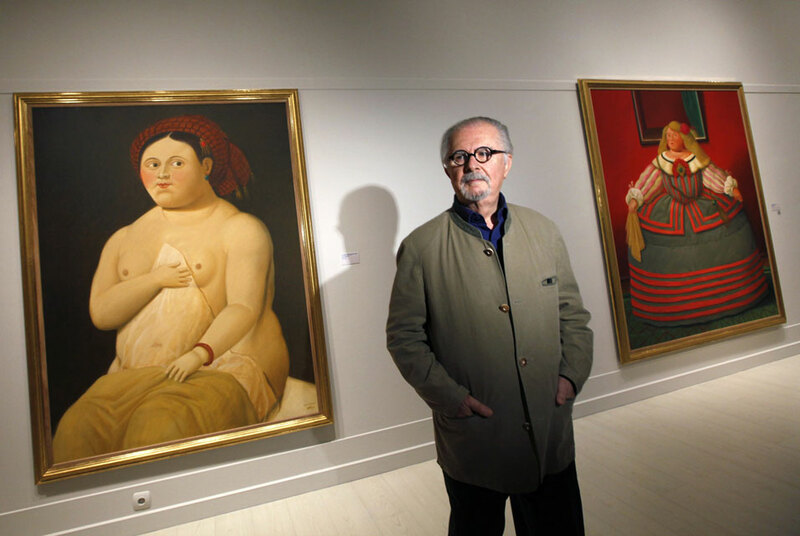 File photo of Colombian artist Fernando Botero posing in front of his paintings "La Fornarina, After Raphael" (L) and "After Velazquez" at the Pera Museum in Istanbul. PARIS (AFP).- Two suspects have been charged in an investigation into the theft within yards of the presidential palace in Paris of a bronze sculpture by Colombian artist Fernando Botero, a judicial source said Saturday. One is a man in his 50s, currently in detention, who has been charged with aggravated theft for taking the sculpture of a mother and a child from a gallery in central Paris on November 4. The work called Maternity, worth an estimated 425,000 euros ($491,000), was found at the home of a relative of the other suspect -- a lawyer who has been charged with receiving stolen goods. The suspected thief had been arrested Wednesday, after he was caught on camera, a source close to the investigation said. Security camera footage showed the bearded thief caressing the 10-kilo (22-pound) statue of typically fleshy Botero figures, then looking around him before taking the statue from its plinth and discreetly making an exit. "He quickly acknowledged the facts," the source added. The same man is suspected of having stolen a pre-Colombian statue from a Parisian gallery and a bronze piece by Alberto Giacometti during a salon on the Champs-Elysees in October. The suspect told investigators that he had given the Botero statue to the lawyer. During a search of his home, police found the pre-Colombian work and another stolen statue. The Giacometti work is still missing. The brazen theft of the Botero statue took place at a gallery near the closely guarded streets where the French president's residence and the British and Japanese embassies are located. Security around the Elysee presidential palace has been heightened since the country was hit by a series of terror attacks over last two years. The gallery is also almost opposite the interior ministry, which is in charge of security and the police. Botero, 85, is Latin America's best known living artist, and is renowned for his slightly surreal and often comic fat figures, which have made his paintings and sculptures hugely popular across the globe.